The Russian stock market endured its biggest one-day drop in four years on 9 April after the US Treasury imposed sanctions on several Russian individuals and companies. UK-listed names were caught up in the move, which threatens Western investment in Russia. 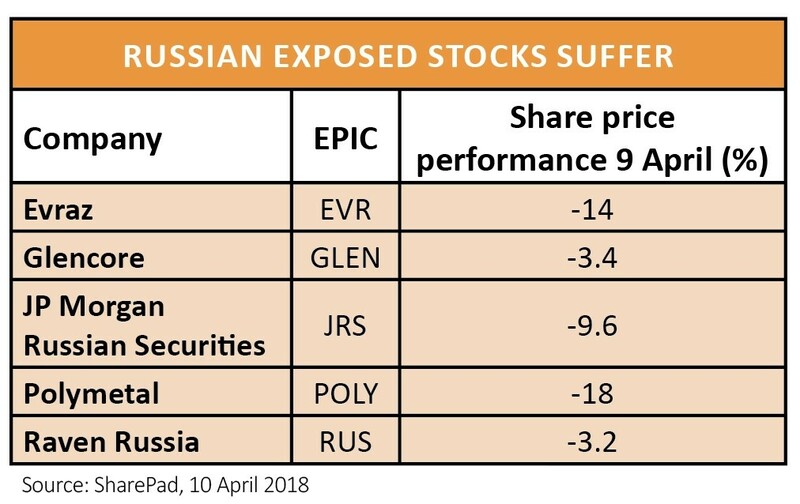 Steel producer Evraz (EVR) and gold miner Polymetal (POLY), both based in the country, suffered large double-digit declines while sector peer Glencore (GLEN) was also hit. It has an 8.75% stake in one of the companies directly affected by the sanctions – Russian aluminium producer Rusal. The price of aluminium spiked as Rusal is the largest supplier outside China and reportedly commodity traders have been advised to stop buying from the company.